Since my daughter was diagnosed with a peanut allergy at 17 months of age, my nightmares have had a recurring theme. In them, she has a severe reaction and we are away from home. Sometimes the settings are as mundane as playgrounds where children run wild with peanut butter sandwiches. Other times we are isolated, camping in the middle of the woods, or on a boat. Most often, we are on an airplane. I’m not a comfortable flier to begin with, but when my daughter is with me, the winged tin can takes on all the qualities of a death trap. I don’t fear water evacuation. I fear the peanuts and cashews I see ground into the floor even after I’ve called ahead to warn the airline of a peanut allergy. I tense at the sound of every snack package ripped open because I have no idea what has been brought on board and whether this will be what sends my daughter’s immune system into overdrive. I handed her one–this is routine for us–and flagged the flight attendant. I identified our group as the peanut allergy and asked we could get up and clean her seat of residue, even though the fasten seatbelt sign was illuminated. The flight attendant offered to take her to the back and help our group of five find another group with whom we could switch seats. My daughter walked down the aisle and I offered a reassuring smile from my middle seat. “Where’s the mom? Do you have an Epipen?” Maybe 30 seconds had passed from when she stood. Two or three minutes since she asked for a Benadryl. I grabbed the bag from under the seat and sprang into action. I suppressed my urge to panic or show my fear. My daughter stood in the back galley, looking pale. The backs of her legs were blotchy with hives, an angry wave spreading north and south with a ferocity I’d never seen. “Do you want to do it?” I asked as I pulled off the cap. “I’m scared.” Her voice rarely trembled, but this time it did. “Okay. I’m going to give you a big hug.” I stood behind her and wrapped my 5’2″ frame around her 5′ one. “On the count of three. One. Two. Three.” She tightened her grip. We counted to ten. Several new faces had joined us in between. I have no recollection of who came when or how they got there. Time bends and narrows in an emergency. Lots went on while I held her. My husband cleaned seats and surfaces, people changed seats, flight attendants procured enough new in the package blankets for us to make a sort of blanket fort to protect her from contact with potential contaminants and two medical professionals, a nurse and a pharmacist, stepped forward to help monitor my daughter’s vitals and the reversal of the allergic reaction. I owe a huge thank you to amazing flight crew working Delta 304 on July 3. I didn’t get all of your names, but you are all my heroes. Our lives seemed pretty up in the air, but you kept us grounded, especially Rosanna (P.S – I hope your daughter outgrows her allergy and that you never need to use an Epipen on her). 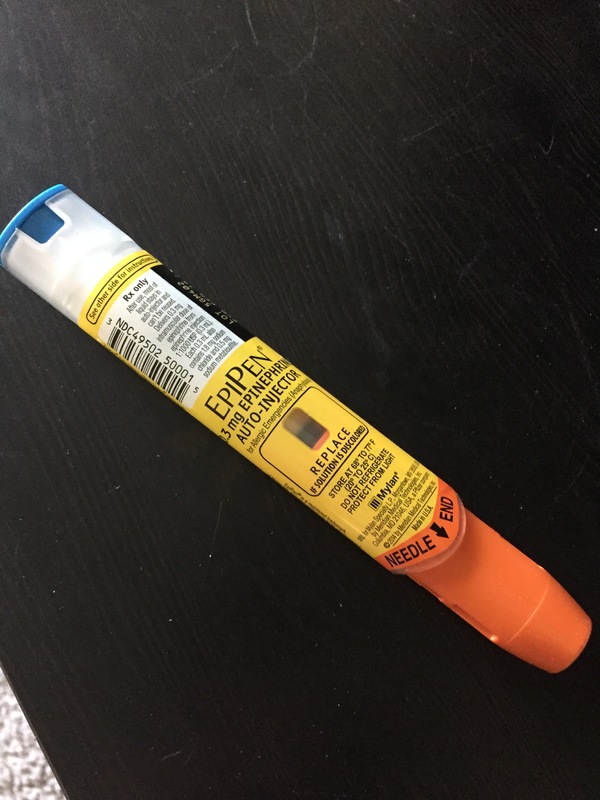 To the pharmacist and the nurse, I thank you so much for your calming presence and for helping to ensure we didn’t have to use the second Epipen. The flight crew called ahead and paramedics walked my daughter off the plane when we landed at Hartsfield-Jackson Atlanta airport. They were gentle giants (seriously – I think they were all at least 6′ tall) who gave my daughter the best care possible. You’d expect in an airport the size of Atlanta that everyone would be in a rush, but they spent more time assessing her symptoms than we’ve sometimes experienced during some urgent care visits. Thanks, Mary, for looking after your grandson and keeping him calm, while your granddaughter needed medical attention. He said later he was scared, but felt better with you beside him. I also want to thank my fellow passengers on Delta 304. I was worried you’d be mad that our emergency disrupted the drink service and delayed your disembarking from the plane, but as the paramedics escorted us off, many of you offered well wishes and reassuring smiles. Your kindness gives me hope. We may never know exactly what triggered this episode. But it has been a reminder that we must maintain our vigilance, even when we can’t see the allergen. We got lucky this time. She didn’t ingest peanuts. We had the Epipens handy. We had a lot of wonderful people willing and able to help. This may not always be the case. My nightmares continue. If you’ve read this far, and are interested in doing more to make air travel, school, and life safer for those with life threatening food allergies, please visit Food Allergy Research & Education. They will get a fat check from me this year. This entry was posted in Epinephrine, Food Allergy, Life Lessons, life saving, parenting, Preparations, Travel and tagged air travel, ATL, Delta Airlines, Delta flight 304, Epipen, FARE, first responders, flight attendants, food allergy, gratitude, Hartsfield-Jackson Airport, nurse, nurses, paramedics, peanut, peanut allery, pharmacist, safety, travel, Tree nut allergy. Bookmark the permalink. So glad your daughter’s okay. That must have been truly terrifying!